Ice, snow and wind can have devastating consequences on your home; fortunately, there are precautions you can take to avoid winter related damage. Keep in mind, the time to winterize is when the leaves begin to turn and not when the snow begins to fall. Clean out gutters. 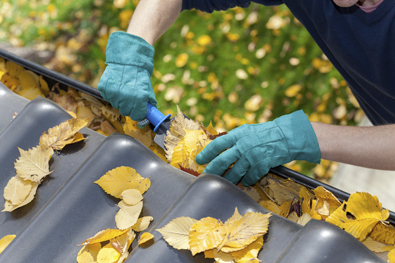 Remove leaves, sticks and other debris from gutters, so melting snow and ice can flow freely. This can prevent ice damming, which is what happens when water is unable to drain through the gutters and instead seeps into the house causing water to drip from the ceiling and walls. Seal cracks and holes in outside walls and foundations. Use caulking to seal cracks and wall openings to prevent cold air and moisture from entering your home. Caulk and install weather stripping around windows and doors to prevent warm air from leaking out and cold air from blowing in. Keep the house warm. Set the thermostat no lower than 65 degrees to keep pipes from freezing inside the walls of your house, where temperatures can be much colder. Add extra insulation to attics, basements and crawl spaces. If too much heat escapes through the attic, it can cause snow or ice to melt on the roof. Water then can refreeze, leading to more ice build-up—and even ice dams that can damage your roof. Well-insulated basements and crawl spaces will also help protect pipes, and you may also consider insulating garages and other unfinished areas to keep pipes from freezing. Check pipes. Look closely for the presence of cracks and leaks, and have them repaired immediately. Pipes in attics and crawl spaces should be protected with insulation or plug-in heating cable. When purchasing heating cable, be sure to select UL®-listed models with built-in thermostats to turn on the heat on when it is needed. And always follow manufacturers instructions closely. Learn how to shut the water off and know where your pipes are located. If your pipes freeze, time is of the essence. The quicker you shut off water or direct your plumber to the problem, the better your chance of preventing major damage. Hire a licensed contractor to look for structural damage. (And have all necessary repairs performed as soon as possible.) Also, inquire about measures to prevent flooding from melted snow and ice runoff. Plastic coatings for internal basement walls, sump pumps and other improvements can prevent water damage to your home and belongings. Flooding related to melting snow can overburden sewer systems, causing raw sewage to back up into the drains in your home. Backed up sewers can wreak havoc, causing thousands of dollars in damage to floors, walls, furniture and electrical systems. Sewer back-up is not covered under a typical homeowners or renters insurance policy, but must be purchased as either a separate product, or an endorsement. Nor is sewer backup covered by flood insurance, which is a separate policy available from the National Flood Insurance Program (NFIP), that covers floods from tidal surge and overflowing bodies of water.